The text below is a short guide on how to access and login eTenet portals located at https://secure.etenet.com. 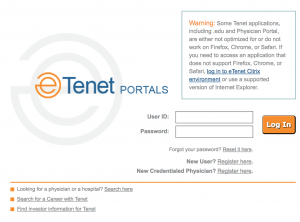 eTenet portals are owned and operated by Tenet Healthcare. Tenet Healthcare Corporation is a healthcare company with headquarters in Dallas, Texas. At the moment of writing this article Tenet Healthcare Corporation operates 470 outpatient centers in 14 states primarily in California, Florida, Michigan and Texas. eTenet Portals website was created for Tenet employees to access important information about schedules, benefits, and payments. Navigate to https://secure.etenet.com. Make sure that your browser displays a lock icon next to the website address in the address bar. This ensures that your connection with the website is secure and could not be compromised. Avoid accessing websites with sensitive information from internet cafes or other places with potentially unsafe internet connections. Type in your User ID and Password you received from Tenet. Make sure that your Caps Lock is off and you are typing your login information in a correct case. Click on Log In button to proceed to eTenet Portal. If you password is not working make sure that your Caps Lock button is off and you are typing it in the correct case. If you forgot your password you need to click on “Reset it here” link located on https://secure.etenet.com entry page. You will be transferred to Reset password page. For issues with eTenet Portal you can contact your local Information Systems Department or Tenet Service Desk phone number 1-800-639-7575. Tenet Healthcare could be reached at 469-893-2000.